Ryan Laukat has been designing board games since he was a teenager. He's the principal artist at Red Raven Games and his artwork is phenomenal. 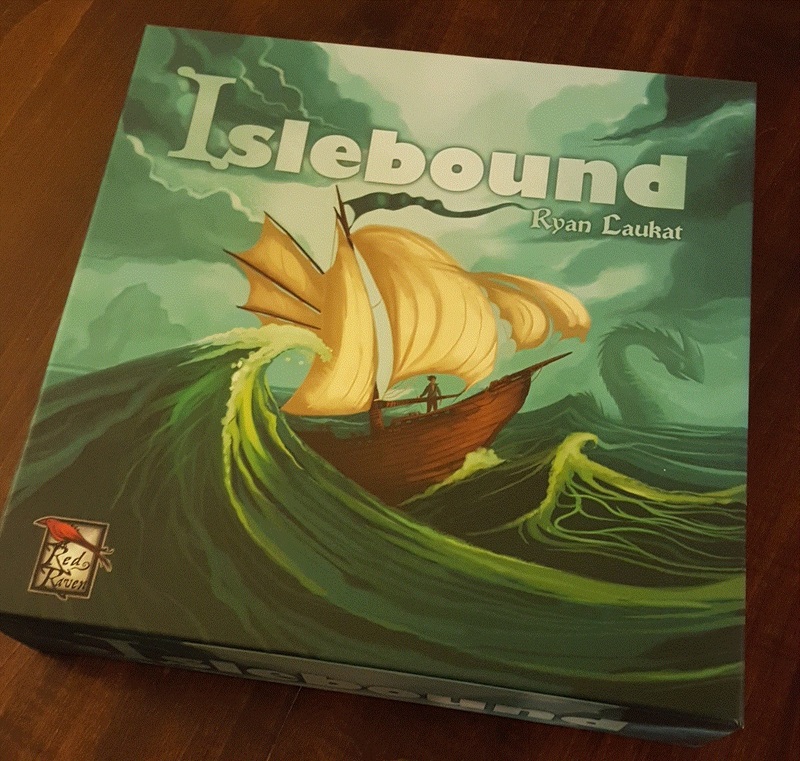 I had a chance to chat with Ryan at Gen Con 2016 and pick up a copy of his latest game - Islebound. Even the box is gorgeous! In Islebound, up to four players compete for renown (i.e. 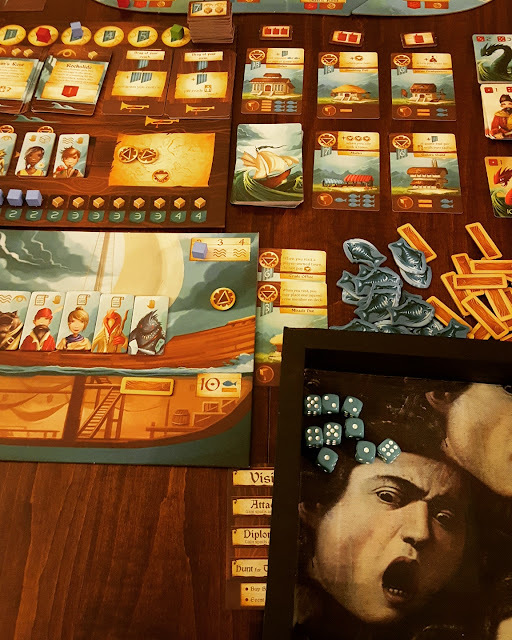 victory points) obtained through taking over ports through diplomacy or warfare, constructing or buying buildings, amassing cash, and completing in-game actions such as visiting ports or completing events. Our storyline is that each player is a seafaring captain, managing a crew aboard their ship and interacting with various port communities. It's a lovely theme. The mechanics of the game are fairly straightforward and make sense within the constraints of Islebound's plotlines. They're well detailed in the accompanying rulebook and player summary cards are provided for easy reference during game play. I've played the game on two different evenings with two different sets of opponents and none of us had any trouble understanding the finer points of the rules nor were we left with any lingering questions. In this area control game, in each round every player, one at a time, gets to choose from four standard actions (some of which grant the ability to immediately complete a second standard action) and then additionally may complete one or more of the "free" bonus actions. As soon as one player has constructed or bought their eighth building, the round is completed and the game ends. The player with the most renown at that point wins the game. Very simple rules, but the game does have some complexity in the details of the actions that may be performed and the ways in which they can be combined to generate renown. Pictured here is the standard setup. Every player has a ship board where they keep their three starting crew members on deck, plus any additional crew they hire throughout the game. Players may use their crew members to do specific tasks and when they do so, they "exhaust" the crew member and put them below deck (directly below the active crew members) to rest. The shipboard also holds cargo - up to 10 fishes and/or wood planks. Additionally, I've got my cash resting on my ship board and all players have a speed track on the upper right of their ship board to record how fast their ship moves i.e. how many spaces they can move their ship across the sea board. Also shown in the picture is the main, shared board which holds the labor market of crew members that can be hired; the treasury chest where port tariffs to unowned ports are paid and treasure hunting is done (one of the standard actions during a round); the influence track where members place cubes to claim influence when instructed or remove cubes to use influence to take over a port community through diplomacy; the renown track (each time a player moves past the 6th space they claim a renown token worth 7 and also get the spoils listed on the token); the event deck that dictates the current events enabled that players may elect to complete if they're at the associated port; and the reputation deck that offers up rewards to be claimed if the minimum qualifications are met. The market of available buildings to construct or buy; the supplies of wood, fish, coins, and books to be used as directed; and the sea board itself which depicts the various port communities, their cost to attack or takeover through diplomacy, and their benefits offered to those who visit are also visible in the picture above. Here's a closer shot of the beautiful sea board. Again, the artwork is just fantastic. 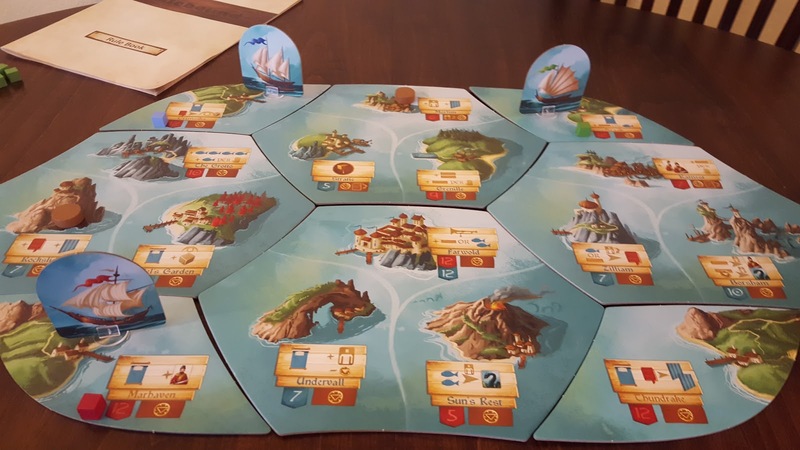 The sea board is made up of several pieces and this allows for easier storage in the box as well as the option to flip over the pieces and change up the port communities and their benefits. Likewise, here's a better view of my ship board, my buildings, the building market, the supply of Serpent and Pirate cards (used when conquering ports through war), and the main board, from the first game of Islebound I played (Note:The Medusa dice tray - used to roll the Islebound dice in to determine if warfare is successful when attacking a port - is one of my pet projects and not part of the game components). Look at the creative details on the crew members! Another nice touch Ryan has provided in Islebound is that all of the crew members have the backside of their card printed with expansion characters for one of Red Raven's other games called Above and Below. So when you purchase Islebound you are also gaining an expansion for that other game. Everyone I've played Islebound with has had such a good time with the game. And in both games, the competition was close all way up through the very last round. This isn't a game that lends itself to a runaway leader. 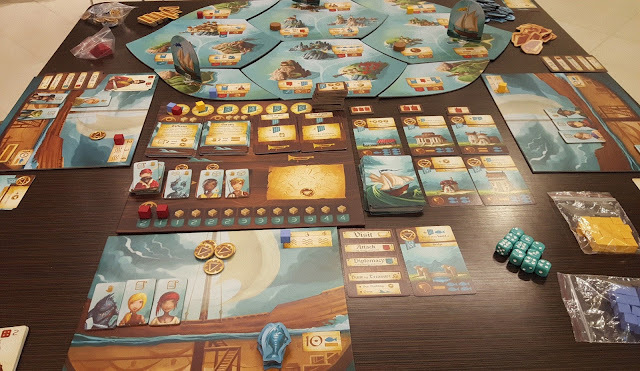 One final comment on how beautiful this game is - during the last play through we were seated in a crowded public shopping center and many many people stopped by to comment on the visual appeal of the game and to ask questions about Islebound. I was delighted to recommend it to everyone who asked.